DIX, DOROTHEA. (1802-1887). American reformer who helped established the first American asylums for the mentally ill. ALS. (“D.L. Dix”). 2pp. 4to. St. Peter, June 29, 1874. 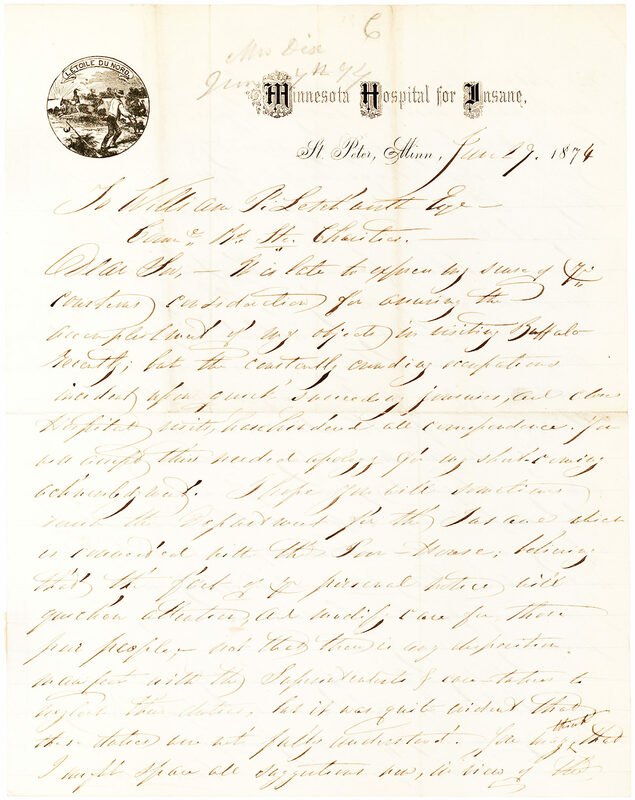 On “Minnesota Hospital for Insane” letterhead, illustrated with the state seal and motto, “L’Etoile du Nord.” To American Quaker businessman and philanthropist WILLIAM P. LETCHWORTH (1823-1910). 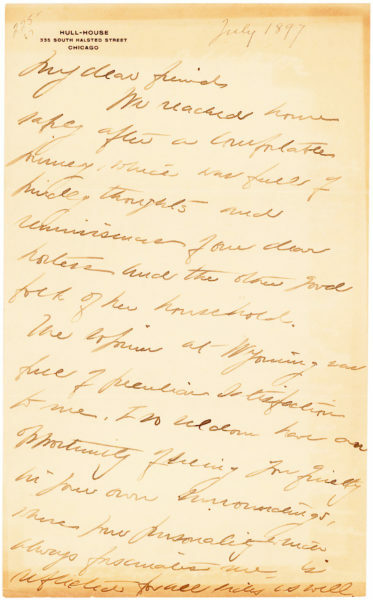 “It is late to express my sense of yr. courteous consideration for assuring the accomplishment of my object in visiting Buffalo recently, but the constantly crowding [?] occupations incident upon quick succeeding journies [sic.] and close Hospital visits have hindered all correspondence. You will accept this needed apology for my short-coming acknowledgement. I hope you will sometimes reach the department for the Insane which is connected with the Poor-House believing that the fact of yr. personal notice will quicken attention and modify care for those poor people – not that there is any disposition manifest with the Superintendents & care-takers to neglect their duties, but it was quite evident that these duties were not fully understood. You may think that I might spare all suggestions now, in view of the very large powers and the very large number of associated visitors lately appointed – and here you may be only judging correctly – it is but just to hope large benefits will early result through the exercise of a full authority, as now delegated. 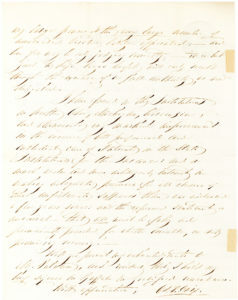 I have found in the Institutions in Northern Ohio, Michigan, Wisconsin, and Minnesota very marked improvement in the exercise of both professional and custodial care of Patients in the State Institutions for the Insane: and a much wider and more intelligent interest in making adequate provision for all classes of these unfortunate sufferers than was evidenced a few years since: now the expressed sentiment is universal – that all must be fully and permanently provided for whether curable, or not promising recovery. 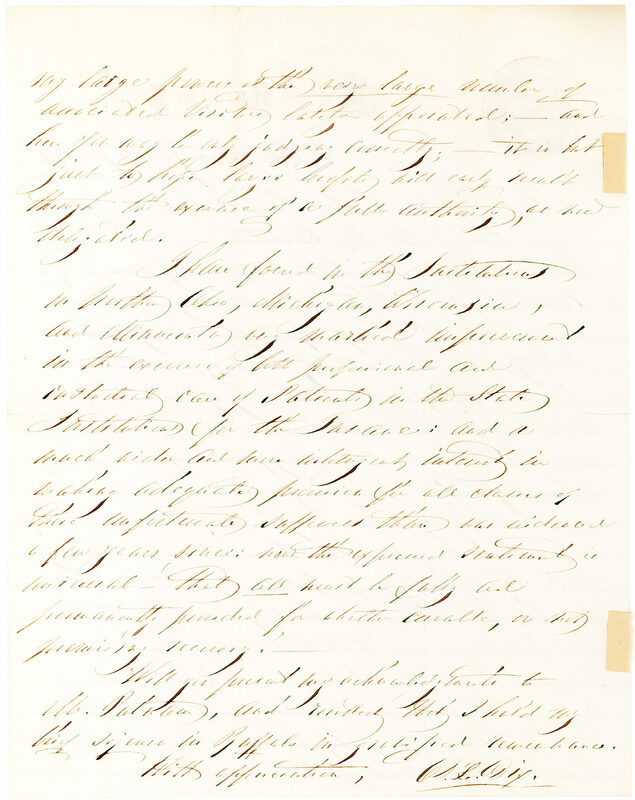 Upon her return to the United States in 1840, Dix conducted an investigation of the mental health system, such as it was, in Massachusetts and issued a report to its legislature which voted to expand the state mental health hospital. Using the same methodology, she helped improve mental healthcare in numerous states and was instrumental in the founding of some of the first state mental hospitals including those in Pennsylvania, New Jersey, North Carolina, and Illinois, leading to the expansion of such facilities in scores of other states. Over the course of several decades, Dix was “a leading figure in those national and international movements that challenged the idea that people with mental disturbances could not be cured or helped. She also was a staunch critic of cruel and neglectful practices toward the mentally ill, such as caging, incarceration without clothing, and painful physical restraint,” (“Dorothea Dix 1802-1887,” American Journal of Public Health, Parry). Her work on behalf of the mentally ill in America culminated with the 1854 passage of the Bill for the Benefit of the Indigent Insane, passed by both houses of Congress, and would have used federal land grants to help establish asylums. However, the measure was vetoed by President Franklin Pierce who maintained that social welfare projects were the responsibility of the state and not federal government. In response to this defeat, Dix devoted herself to the cause of the mentally ill abroad, specifically in Scotland, Canada and the Channel Islands until she was appointed Superintendent of Army Nurses at the outbreak of the Civil War, ensuring that female nurses were allowed in combat hospitals and that Union and Confederate wounded were treated with equal care. After the war, she resumed her campaigns on behalf of the mentally ill as well as the disabled. 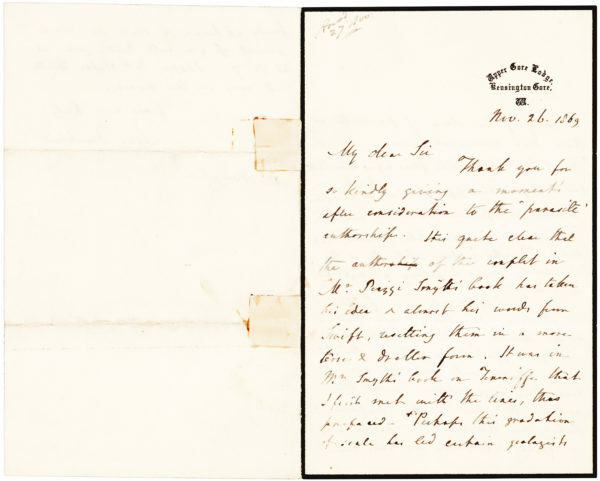 Our letter relates to a visit Dix made to Buffalo, one of America’s wealthiest cities at the time, during the construction of the Buffalo State Asylum for the Insane that broke ground in 1870. 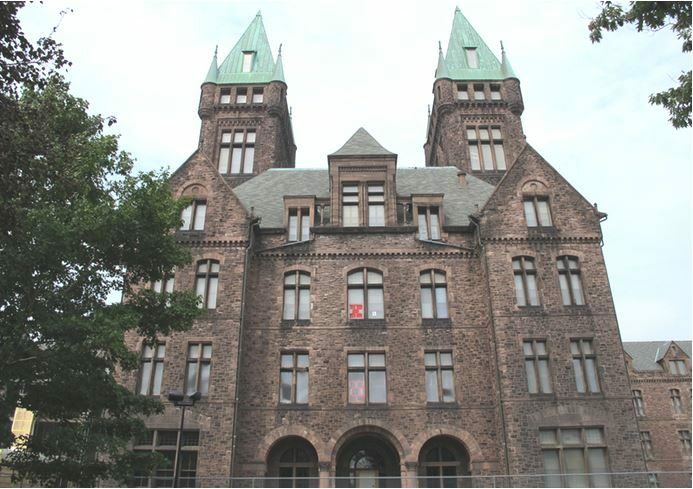 A state-of-the-art facility based on the Kirkbride system in which a central administration building was flanked by patient wards on a sprawling campus, it was designed by celebrated American architect Henry Hobson Richardson with grounds by landscape architects Frederick Law Olmsted and Calvert Vaux. At the 1871 ceremony for the laying of the cornerstone, Buffalo politician James O. Putnam (1818-1903), praised the work of Dix in the highest terms and stated that New York State “was the first to act upon the new idea that idiocy is not an impenetrable darkness, and that its pitiable victims may by kindness and patient instruction be led, at least into the starlight of human intelligence,” (Addresses, Speeches and Miscellanies on Various Occasions, from 1854 to 1879, Putnam). The facility was still in use for its original purpose into the latter part of the 20th century; it is now a luxury hotel. 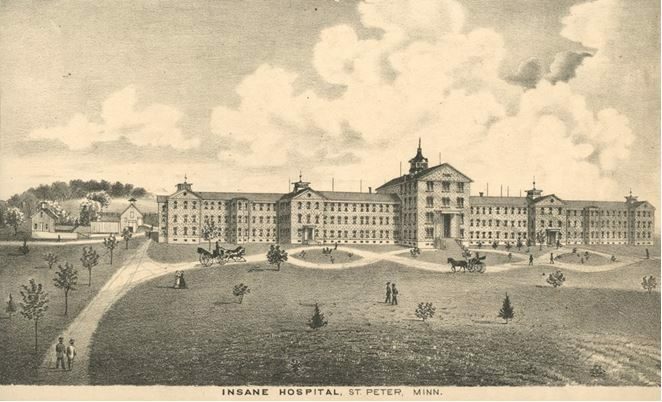 Our letter is written on the letterhead of the Minnesota Hospital for the Insane in St. Peter – the state’s first such institution, which had been authorized by the legislature in 1866. 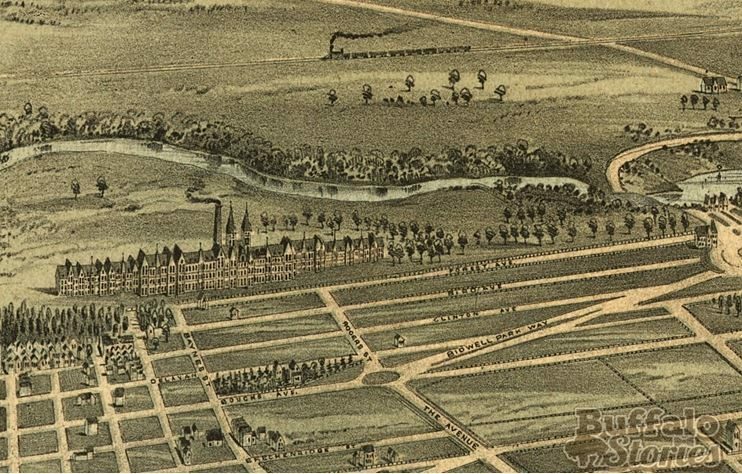 By 1872, however, the Minnesota board of health declared the facility overcrowded and conditions appalling, prompting the construction of several more hospitals for the mentally ill during the 1870s and 1880s. Letchworth became a member of the New York State Board of Charities in 1873 and its president five years later. He had a special interest in the plight of indigent children. In 1875, he conducted a tour of all orphanages, poor houses and juvenile reformatories and made recommendations to the state based on his observations. 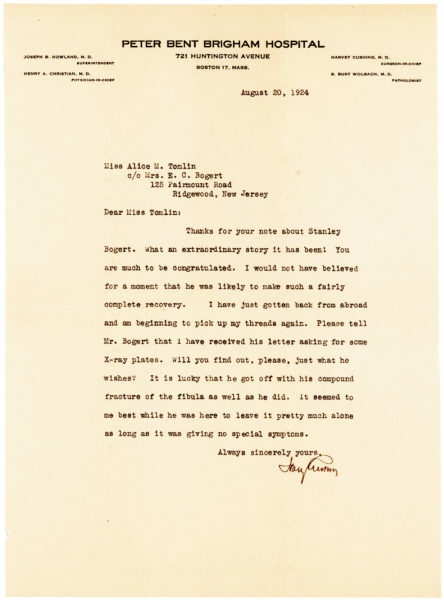 He also toured such facilities in Europe and other parts of the United States, authoring The Insane in Foreign Countries and Care and Treatment of Epileptics. In addition to his humanitarian work, Letchworth spent much of his life and fortune building his Glen Iris Estate in New York’s Sehgahunda Valley, which, upon its donation to New York State, became Letchworth State Park, a site of geological and archeological interest. Written on the recto and verso of a single, lined sheet. Folded with some dust staining and pencil notations in the upper margin. Two minor remnants of prior mounting in the right margin of the verso, otherwise in fine condition. Rare with such important content.